You can not show TestNG default reports to your manager or client because they are not much more readable and Interactive. ReportNG Is very good add-on to generate Interactive and readable reports for selenium webdriver tests. It Is simple HTML reporting plug-In. 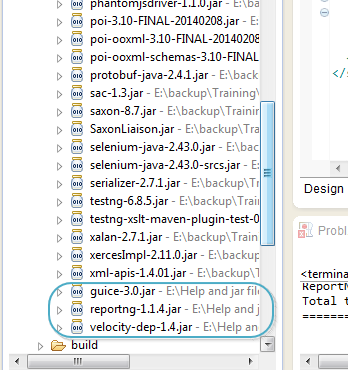 Also It Is very very easy to configure ReportNG with your selenium project. If you remember, XSLT reports are Interactive too and we have generated XSLT reports In webdriver datadriven framework. If you need XSLT reports then you can READ THIS POST. Follow bellow given 5 steps to generate ReportNG HTML report. You need to download bellow given jar files. You can download all above three files from THIS PAGE. Go to THIS PAGE and click on Download link as shown In bellow Image to download reportng-1.1.4.jar and velocity-dep-1.4.jar files. Go to THIS PAGE and click on guice-3.0.zip download button as shown In bellow Image to download reportng-1.1.4.jar and velocity-dep-1.4.jar file. Now you need to add above all three files In project's build path. If you don't know how to add jar files In project's build path then refer "Adding jar Files In Project's Build Path" section on THIS PAGE. So now your Referenced Libraries folder have three more files as shown In bellow Image. You need to disable default listeners of testng. Right click on project folder In eclipse. Go to Properties. - It will open Properties dialog. Go to TestNG and check Disable default listeners checkbox as shown In bellow Image and click on OK button. My project name Is Test_NG. Now create package under your project with name = Testing_Pack and add bellow given two test cases under that package. 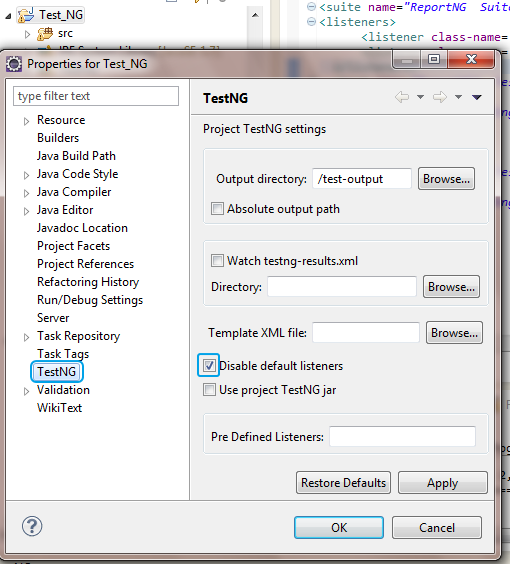 Now create testng.xml file under your project folder and add bellow give configuration In It. Pink color Highlighted lines are responsible to generate ReportNG reports so do not forget to Include them In your testng.xml file. Now run your test cases from testng.xml file. On completion of test execution, refresh your project folder. It will create/update test-output folder. Explore that folder then explore html folder. You will find index.html file Inside It. To open index.html file. Right click on index.html file -> Open With -> Web Browser. It will open ReportNG HTML Interactive report as shown In bellow Image. Could someone tell me what purpose of the second listener?